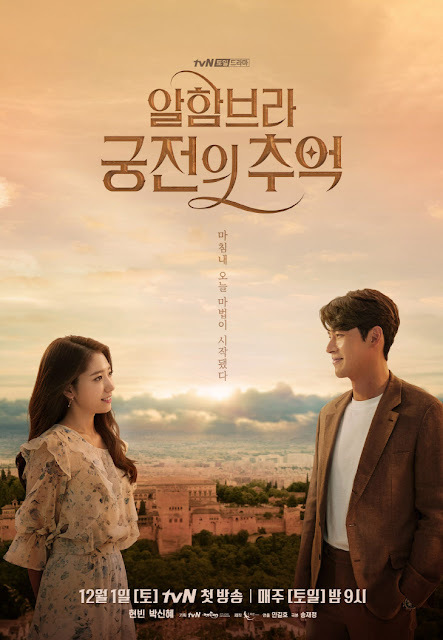 Memories of the Alhambra tells the unique and suspenseful love story of Yoo Jin Woo and Jung Hee Joo.Strong spirited Yoo Jin Woo is the CEO of an investment company with a degree in engineering and a knack for developing video games. He has an adventurous and competitive spirit. Suffering after his best friend betrays him, he takes a business trip to Granada, Spain in search of the mysterious inventor of an innovative augmented-reality video game. He ends up at a hostel that Jung Hee Joo owns.Hee Joo is a former classical guitarist who came to Spain to further her studies. After the death of her parents, she takes on various jobs to support herself, including running the old hostel.They are both drawn into a series of strange and unexpected events. I can’t remember as to specifically why I started to watch the drama, either I was bored or Chanyeol was too cute to resist. His character is an 18 year old reclusive genius programmer that created an AR game and the story started because of him. He has an important role in this drama so keep an eye on him. It’s not the regular CEO falls in love with younger girl of the same race in a foreign country and somewhat they will meet again in Korea where their love story will continue. I really thought that’s the reason why the title of Memories Of The Alhambra because of what I said but it’s not that simple. Yes, the CEO did "fall in love" with the younger girl but it’s more complicated than that. I was watching the first episode out of boredom but it got me hooked! Next thing I knew, it was already 4am and I am watching the 4th episode already. It was freaking addicting! I’m always looking forward to next week’s episode.It reminds me so much of W, Two Worlds Apart,the Korean drama starring Lee Jong Suk and Han Hyo Joo that when I looked up, they have the same writer. They have that unique element where I can’t find in other regular dramas (ones that aren’t written by the author), there are times you can’t distinguish between fantasy x reality. One scene, it’s reality then next scene is fantasy. It’s somehow her “signature” because this kind of events also happened during W.
The drama is a mixture of fantasy, suspense, sci-fi, romance and melodrama. I can’t believe Hyun Bin is already an ahjussi. Like he’s 36 and why does he look more handsome than before. I started liking him during the Kim Sam Soon days and he did age gracefully. I mean he became more handsome if that’s possible. And please let me just talk about how cute Chanyeol is. The 26 year old Beagle is an 18 year old in the drama, and I like how he portrayed his role. Job well done Loey! So if you’re looking for a unique drama that will make you wonder and addicted as to what the next episode will be, then I recommend this. I repeat, it’s not the regular CEO falls in love with younger girl of the same race in a foreign country and somewhat they will meet again in Korea where their love story will continue. I really thought that’s the reason why the title of Memories Of The Alhambra because of what I said but it’s not that simple. Yes, the CEO did "fall in love" with the younger girl but it’s more complicated than that. Sorry for the late review. This is actually sitting on my laptop for weeks now but I don’t know what to say. HAHAHA. Will you watch it again? 4.5 because the ending is an open ending which I really hate when it comes to dramas. Where can I watch the drama? Want to download the drama and watch it on your Android phone?